This folder contains all of our case studies for various industries: Technology, Automotive, Real Estate, Education, and Marketing Automation. 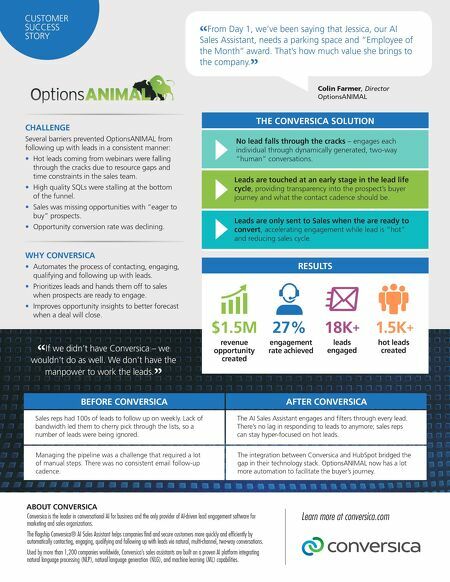 CHALLENGE Several barriers prevented OptionsANIMAL from following up with leads in a consistent manner: • Hot leads coming from webinars were falling through the cracks due to resource gaps and time constraints in the sales team. • High quality SQLs were stalling at the bottom of the funnel. • Sales was missing opportunities with "eager to buy" prospects. • Opportunity conversion rate was declining. WHY CONVERSICA • Automates the process of contacting, engaging, qualifying and following up with leads. • Prioritizes leads and hands them off to sales when prospects are ready to engage. • Improves opportunity insights to better forecast when a deal will close. CUSTOMER SUCCESS STORY " If we didn't have Conversica – we wouldn't do as well. We don't have the manpower to work the leads. " THE CONVERSICA SOLUTION RESULTS Conversica is the leader in conversational AI for business and the only provider of AI-driven lead engagement software for marketing and sales organizations. The flagship Conversica® AI Sales Assistant helps companies find and secure customers more quickly and efficiently by automatically contacting, engaging, qualifying and following up with leads via natural, multi-channel, two-way conversations. Used by more than 1,200 companies worldwide, Conversica's sales assistants are built on a proven AI platform integrating natural language processing (NLP), natural language generation (NLG), and machine learning (ML) capabilities. leads engaged engagement rate achieved hot leads created 27% 1.5K + 18K + revenue opportunity created $1.5M Learn more at conversica.com ABOUT CONVERSICA " From Day 1, we've been saying that Jessica, our AI Sales Assistant, needs a parking space and "Employee of the Month'' award. That's how much value she brings to the company. " Colin Farmer, Director OptionsANIMAL BEFORE CONVERSICA AFTER CONVERSICA Sales reps had 100s of leads to follow up on weekly. Lack of bandwidth led them to cherry pick through the lists, so a number of leads were being ignored. The AI Sales Assistant engages and filters through every lead. There's no lag in responding to leads to anymore; sales reps can stay hyper-focused on hot leads. Managing the pipeline was a challenge that required a lot of manual steps. There was no consistent email follow-up cadence. The integration between Conversica and HubSpot bridged the gap in their technology stack. OptionsANIMAL now has a lot more automation to facilitate the buyer's journey. No lead falls through the cracks – engages each individual through dynamically generated, two-way "human" conversations. Leads are touched at an early stage in the lead life cycle, providing transparency into the prospect's buyer journey and what the contact cadence should be. Leads are only sent to Sales when the are ready to convert, accelerating engagement while lead is "hot" and reducing sales cycle.